Glass filling in diamonds to improve their apparent clarity is known for few decades where cleavages and fractures of a diamond are filled with a material of high refractive index (closer to that of the diamond). Commercially, the glass filling of diamonds was first introduced by Zvi Yehuda of Israel in 1980s, while later on the treatment was performed by many other treaters. And since 2003, similar glass-filling started to apply on low-grade rubies too, which became the most controversial gemstone treatment to appear in the past decade. In recent times, in addition to the regular cuts, glass-filling has been applied on 'polki' cut diamonds (figure 1) as well, and that too in large quantities. Most of these glass-filled 'diamond polkis' are being sold undisclosed, especially in 'Kundan-Meena' jewellery (figure 2). Figure 1: A pair of glass-filled diamond 'polki'. Figure 2: A typical 'kundan-meena' necklace set with ear-rings. Note the metallic reflections from the diamond polkis, which is caused as a result of use of metallic foil. Polki: This is a flat cut diamond with two parallel surfaces being table and a base (figure 1 and 3, centre), while the crown usually is composed of eight facets; this number however may vary depending on the cutter to save the weight. Parab: This is quite similar to a polki, but the difference lies in the pattern of facets which are slightly concave against the flat ones in polki. In addition, the crown portion is quite small as compared to the polki. English Polki: This is comparatively more refined and symmetrical cut than 'polki' or 'parab' and usually contains 24 facets (figure 3, right). Figure 3: Common types of flat cuts used in kundan-meena jewellery include rose cut (left), polki (centre) and 'English polki' (right). All three forms of flat cuts are commonly filled with glass; polki being the more common one. These flat cuts are however backed by metallic foils to enhance the overall brilliance and fire which is a common practice and a method of setting a diamond or any other coloured stone in 'kundan-meena' jewellery. The 'polkis' are usually fashioned from the chips derived during cutting polishing well formed crystals or from flat crystals, or even rejections which cannot be fashioned as regular cuts. These usually contain higher numbers of fractures and cleavages, which are filled with glass to make them usable in jewellery.Filling reduces the visibility of fractures and improves overall clarity. With unaided eye, a filled diamond may appear slightly greasy with a very slight yellowish overtone; in stones with many treated fractures, the yellowish overtone is more apparent. Examination of the fractures and cleavages with a microscope is the best means of positively recognizing the enhancement. These glass-filled polkis can also be detected in a closed back setting in the jewellery. The advantage here is that the polkis are backed by reflective metallic foil, which reflects light back into the diamond once it transmits through, and therefore, typical flash effects can be observed with ease. Flash Effect: This is the most obvious characteristic seen in filled stones. Filled fractures typically display blue colour flash at one angle or illumination which changes to yellow orange on turning the stone or changing the angle of viewing or on changing the illumination (figure 4 and 5). Often, pink, violet and green colour flashes are also observed which are dependent on the exact composition of the filler and illumination. The flash effect is best visible when observed at angles parallel to the fracture, preferably using a fibre-optic light, especially when these polkis are set in jewellery. Figure 4: Typical flash effect seen in glass-filled diamonds includes violet-blue-pink (left) which changes to yellowish-green (right) on change of illumination or angle of viewing.  Figure 5: Sometimes multiple colours can be seen in various parts of the same fracture, depending on the angle of viewing. Crackled Texture: In some cases, the filler compound may partially re-crystallize within the fractures resulting in the formation of fine web like structures (figure 6), similar to the mud crack seen in dried river or lake beds. Presence of such features conclusively identifies the presence of filler in fractures. Figure 6: This web-like structure is 'crackling' caused as a result of partial re-crystallization of filler compound within the fractures. Flow Pattern / Uneven Filling: Since the glassy compound is forced into the fractures in molten form, it flows into the open spaces within the fractures which may lead to a feathery appearance (figure 7). These flow structures may appear glassy and give an unnatural melted look. Figure 7: Improper and uneven filling may result in feathery appearance, exhibiting bright iridescent colours in oblique illumination (right). Gas Bubbles: Sometimes, the filler compound may also display trapped gas bubbles due to the shrinkage of the filler compound or air trapped within the liquefied filler. Cloudy Areas: Many filled fractures also display cloudy areas / patches which are probably due to uneven filling and / or disintegration of the filler compound. Colour of the filler: It is also possible to see the yellow-orange colour of the filler (figure 8) within the filled fractures, however, which must be carefully distinguished from natural iron-stained fractures. Figure 8: The filled fractures displays yellow-orange colour of the filler. The filler compounds have typically shown the presence of lead and/or bismuth and bromine in these filled polkis. However in the past, presence of chlorine, boron and oxygen have also been reported in the filler compounds. Durability is an important issue of any gemstone enhancement. Glass filling in diamonds is usually durable under normal conditions including ultrasonic and steam cleaning. Experiments have shown that the filler can be damaged by boiling in acids and can change colour on overexposure to ultra violet light. 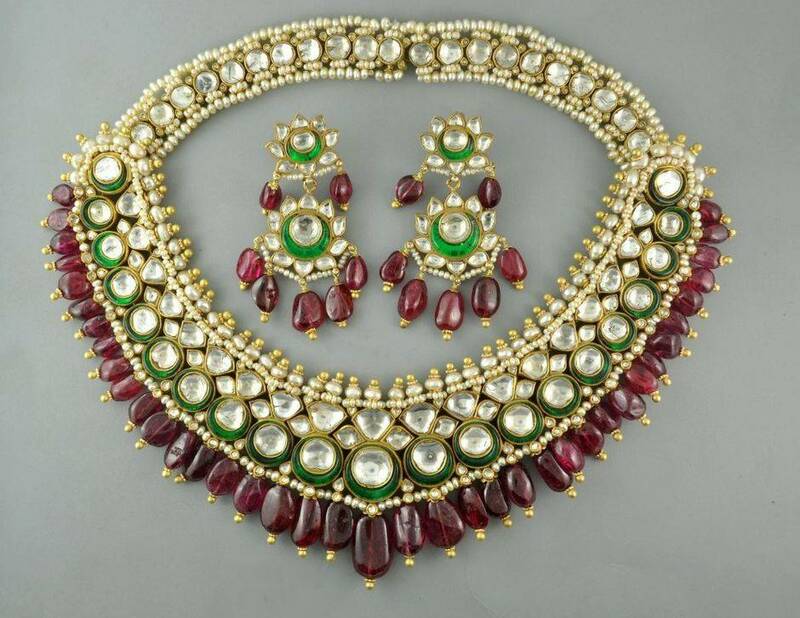 The 'polkis' which are mainly used in kundan-meena jewellery are relatively more durable because this type of jewellery is not exposed to ultrasonic and steam cleaning or acid boiling. However, few jewellers have observed a change in the appearance of diamonds when such jewellery was shipped through air; the fractures became more obvious. This is possibly because of the uncontrolled changes in temperature and pressure conditions in aircraft's cargo cabin. The fracture-filling process does improve the appearance of diamonds; it also acts as a sealant, preventing dirt or other foreign substances entering into open breaks of the diamonds. As per personal discussion with few trade members, it was revealed that glass-filling in diamonds is now being done in Surat also, which is the major cutting centre for diamonds around the World, and from Surat only these 'polkis' make their way to the Indian market. Although, there is nothing inherently wrong with any enhancement process, full disclosure should always be made at every level of sale. However at this stage, such disclosure is being made only by a handful of jewellers while majority of the jewellers-dealers seem to be unaware of the existence of such glass-filled polkis or they are just ignorant. But the fact is, much of the glass-filled 'polkis' used in kundan-meena jewellery is being sold undisclosed.